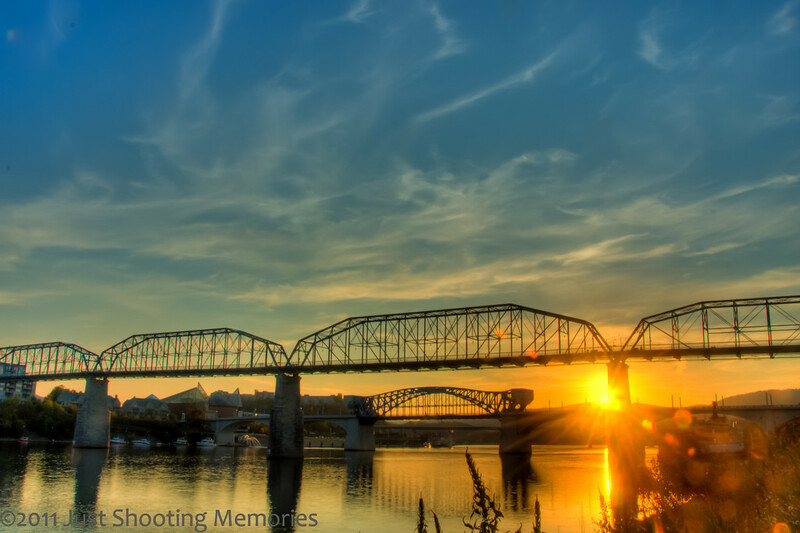 Chattanooga Sunset | Just Shooting Memories! I took this shot of the Chattanooga skyline at sunset in October. A few minutes later, I got another shot of the Chattanooga Skyline at Dusk. It is amazing how much just a few minutes can change the way a complete scene looks. From warm tones to cold, the golden hour or blue hour can be quite exciting and a mad dash for just the right spot. Luckily, I set up for this shot about 45 minutes before sunset, laid back on the grass, relaxed and listened to some tunes. When I first set the tripod up, there was no one there. About 10 minutes before sunset, I had about 10 couples who gathered in the area to watch the sunset. From the angle of the sunset, I can imagine this attracts a lot of couples to enjoy a pleasant evening. Perfectly timed and composed. Well done!